There is nothing quite like the smell of the brewing of Arabic coffee prepared on burning olive branches, just pruned during the olive harvest. The smell of heil (cardamom) cooked in coffee, and the aroma of the burning wood, are almost as delicious as the day’s first cup sipped atop the dry limestone walls that separate the terraces of the wadi (valley). It is mid-morning, early November in Wadi Fukin in the West Bank, Palestine. The family leave their olives on their trees until later in the season than most other farmers in the area, because Abu Nedal thinks it is better to leave the fruit of the baladi (native) variety to ripen longer and so produce more oil. The harvest here runs from mid-October to early November, after the first rains of the season have rinsed the long dry summer’s dust from the trees. Their terrace is located outside of the cluster of houses, the mosque, the main spring and the council building, towards the bottom of the wadi. The olives are picked mainly by hand in a movement resembling the milking of a goat. The fruit is dropped onto a tarpaulin sheet, collected into buckets, then into mesh sacks ready to be transported to the press in a nearby town. Wadi Fukin is a village of about 1,200 residents, made up of a few extended families from two hamoulas (clans) thought to have lived continuously in these central hills of Palestine for thousands of years. Village families share an ancient system of irrigation sourced from natural springs, whose water is collected into pools from which tunnels transport water to the vegetable plots on the wadi’s flat plains. The village recently lost several hundred acres of land to the expansion of nearby Israeli colony Beitar Illit, and its natural springs are drying up due to Israeli extraction and a drop in rainfall likely to be a result of global warming. Abu Nedal has just returned to his village after several decades in a nearby town, where he was involved in various political and social activities, for which he spent some time in prison—the experience of almost half of the adult male population in the occupied Palestinian territories. While he was away his now separated wife Um Nedal and his son Nedal tended the land. Um Nedal is a member of a women’s co-operative in the village, where they make foodstuffs such as hawthorn jelly and weave baskets from olive shoots. Nedal has a permit to work in construction in Israel, something granted to a number of the villagers by the Israeli authorities. He has a barbershop in the village, where he works evenings and weekends—a necessity for the main breadwinner of three households: his mother’s, his father’s and his own. The family feel they are part of a revival in olive planting and growing since the 1980s, when illegal Israeli settler-colonies began to encroach on their land. Local committees have been established to support people in planting olive trees that require little care through the seasons, some of which live for thousands of years. For them this approach is crucial to preserving their connection to the land, because plots that go unworked for a number of years can be claimed by the Israeli authorities using an Ottoman rule that is centuries old. It was a regulation aimed at expropriating communally-owned land in order to privatise it. The practice was continued by the British Mandate from 1918 to 1948, and now the Israeli authorities use it to appropriate land and water resources, as well as to expand existing settler-colonies and establish new ones. Villagers feel the ultimate aim of such measures is to make life in the village so unbearable and unviable that the indigenous villagers leave—a slower, more subtle expulsion than those carried out by the aerial bombardments by the Israeli armed forces that destroyed most of village buildings in the mid-20th Century. Following that catastrophe, and after years of resistance in exile, living in caves and refugee camps, the villagers negotiated their return to the village. This was an unusual outcome not shared by the 500 or so Palestinian villages that were ethnically cleansed in 1948’s Nakba (catastrophe), and again in 1967 when Israel occupied more Palestinian land. As a way of insisting on life, the seed library team is operating as seed detectives, excavating through elder knowledge of the old varieties and the stories that go with them. Village and family co-operation, combined with local and international solidarity from activists who organise to provide moral and physical support for farmers in the village, is central to this revival and to preserving the village’s lands and ways of living. Um Nedal, Abu Nedal and the family have recently, with the help of the agricultural committee, rehabilitated a terrace on the western hill, renovating a well and planting grapevines. Such activities often come under attack from the Israeli authorities, which severely restrict construction on Palestinian-owned land; fortunately, the family’s terrace hasn’t yet attracted such unwelcome attention. Abu Nedal has built a grey-water treatment tank to irrigate the herbs and citrus trees in the family’s kitchen garden. He often cites an old saying —“They who have a fig and olive will never be poor”—when reflecting on the value of these two native species in meeting part of the family’s needs. Olives are eaten, oil is extracted, the dead wood is used for fuel, and soap is made from a by-product of the pressing. Some drink an infusion of olive leaves to treat ailments. Dried figs are dipped in olive oil and eaten for breakfast or as a snack when working in the fields. Fellahi communities have faced land dispossession and alienation since the late 19th Century, when colonisation began to combine with the imported capitalist structures of land privatisation and agribusiness, and now climatic changes are emerging as a third assault upon indigenous ways of living with the land. The family, like others in the village, have (re)enacted creative means, some of which have been described here, to respond to these circumstances. These daily acts of resistance, known in Palestine as Sumud, are carried out to maintain not just their livelihoods but to express social, political and spiritual connections these communities have formed with the land, trees and animals they live among—a bond with pre-monotheistic origins, returning to these ancient hills to enable more than just survival. These daily acts also contribute to the enrichment of individual, family and community’s wellness and self-determination. While the olive trees are directly threatened and attacked by both state and settler violence, heirloom seeds are under threat due to a growing agribusiness industry and a policy of transforming the Palestinian farmer from an independent and productive entity to a dependent and helpless consumer. As a way of insisting on life, the seed library team is operating as seed detectives, excavating through elder knowledge of the old varieties and the stories that go with them. In anticipation of the opening of the library, a plot of land in Battir was planted with heirloom varieties, including a disappearing white cucumber forgotten by the young generation, and an old watermelon variety called Jadu’i. The seed library holds workshops in which students have been actively involved in learning and in creating knowledge. Miss Hayat is a school teacher who works with refugee children. She has been a committed participant in the workshops the library has been offering. One of Hayat’s students filmed a conversation with her grandmother when asked to collect information from elders. Reflecting on the task, the student told Hayat, “I had never thought to sit and talk to my grandmother [in this way]. This was the first time. I didn’t know she had so much knowledge”. Such experiences remind us that the seed is a catalyst for new life—a life that is reweaving itself every day. Through such efforts—seemingly so small—power is found in the simplest and most profound of things. 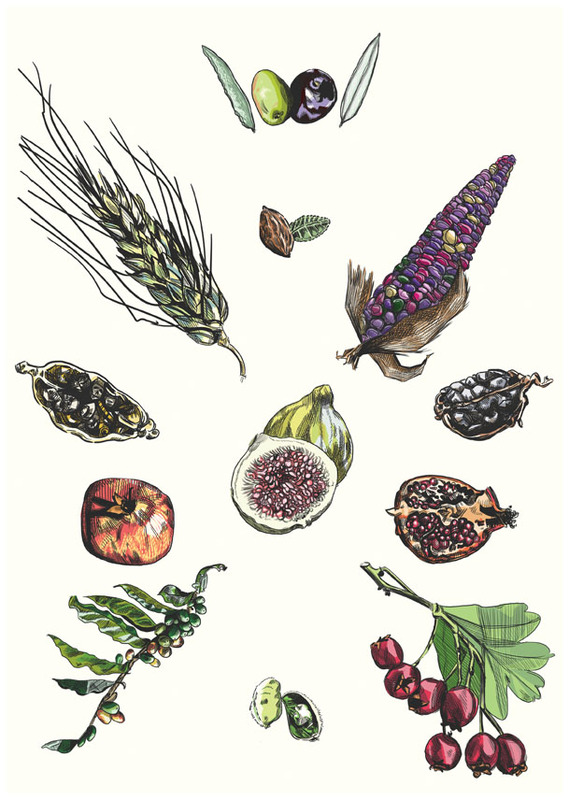 In the form of the heirloom seeds that are the product of tens of generations who have carefully selected and propagated our daily bread and our heritage. These seeds have for millennia been the gift from which sovereignty—over land, heritage and food—is gained and regained. The mere act of saving a seed becomes a subversive act of, as Vivien terms it, ‘agri-resistance’ that generates a sense of resurrection of the spirit of a people buried and at the same time sprouting hope in the most essential of ways. Olive planting and growing by Um and Abu Nedal’s family, like collecting and preserving seeds by the library team, offer a particular Palestinian contribution to the global food sovereignty movement. Vivien Sansour is the founder of the Palestine Heirloom Seed Library. Trained in the field of Anthropology, Vivien worked with farmers worldwide on issues relating to agriculture and independence. Her solo show, Terrain: Palestinian Agri-Resistance, created a collection of people and landscape portraits of agri-Cultural Palestine. She was a selected artist for Confrontation Through Art residency in Nicosia, Cyprus where she was part of the collective exhibit, “Where The Sky And The Earth Touch”. As part of her work on seed autonomy, Vivien is currently developing the seed library program with A.M. Qattan Foundation. Vivien has a B.A. in Political Science and Theatre Arts and an MA in International Studies with a concentration in Anthropology from East Carolina University.